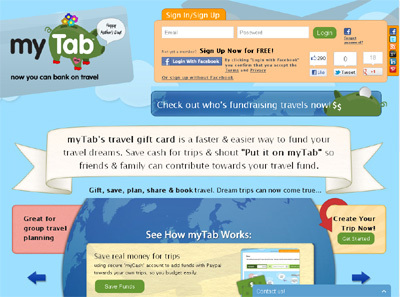 myTab’s a virtual travel gift card where you can save travel cash and shout ‘put it on myTab’ so friends & family contribute towards your trip. Then simply redeem your funds towards travel, all within their website (powered by Expedia). The best part: myTab can also email you a deal that matches funds, travel dates & destination so sit back and let myTab do the work! Brilliant for birthday celebrations, study abroad, wedding/honeymoon registry, philanthropy fundraisers, guys & gals getaways & so much more. No more scrambling for weeks to find that best deal since with myTab, you are travel cash-rich and ready to roam around the planet. A whole new ball game in travel and a bit like a kickstarter for travel yet you don’t need to reach the crowdfund limit to redeem your cash. Everyone is focusing on price and with flash deals now at a crescendo, do you really know you got the best bang for your buck after booking? We’re the only travel site that’s ever addressed the price pain problem and erratic fluctuations – and created a seamless solution. No one even comes close to what we do! Then also think about the $30b gift cards discarded a year from $100b bought – with myTab, there’s an emotional value knowing your gifted cash is going towards an incredible trip.